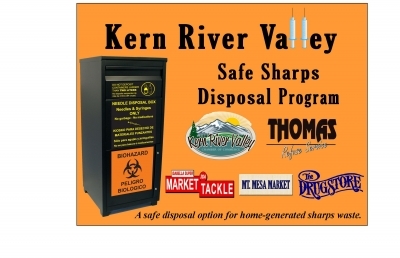 Now all residential sharps users may safely dispose of their needles, syringes or lancets in one of the four kiosks in the Kern River Valley. The kiosks are easy to use and will accept secure sharps containers up to 2 quarts in size. NO Commercial sharps waste permitted. If doctor's offices or medical facilities are using the sharps kiosks, we will be forced to shut down our program. Please report any misuse of the sharps kiosks to 760-379-2618. Look for the sharps kiosks located at Thomas Refuse Service, Isabella Supermarket, The Drug Store, and Mt. Mesa Market.